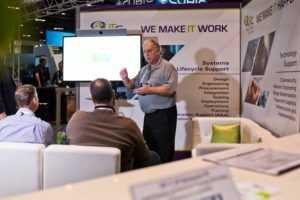 At I/ITSEC 2018, the world’s largest modeling, simulation and training event hosted by the United States Army Program Executive Office Simulation, Training and Instrumentation (PEO STRI), AITC showcased audio-visual integration capabilities at their exhibit. Teaming with their technology partner, AVI-SPL, a Tampa, FL-based company that provides collaboration and audio-visual solutions for organizations worldwide, AITC wanted to demonstrate a new technology solution, offering more intelligence and usability for team collaborations. If you had walked into the booth, you would have been able to experience the cutting-edge technology in our huddle lounge, a collaboration space that can accommodate a workgroup of up to six people. The lounge was outfitted with a Cisco room kit, which enabled the demonstration computer to beam his screen to a TV screen – so no cords necessary. The lounge showcased how collaboration could happen not only within the same space, but also remotely. Whether you have a desktop computer, a smartphone, or a laptop, you could be a part of a meeting seamlessly. And this sort of technology could make facilitating training a whole lot easier and accessible. “It’s not just about the high-end simulation facility, it’s about everyday learning continuing,” explained Steve White, Federal Business Development Manager for AVI-SPL. Working together, AITC and AVI-SPL want to help the U.S. government achieve their identified top two priorities for the federal workforce—to enable collaboration and knowledge-sharing. “What AITC is able to do is to bring people together to create solutions for the government,” says Lydia Perez, sales operations manager at AITC. 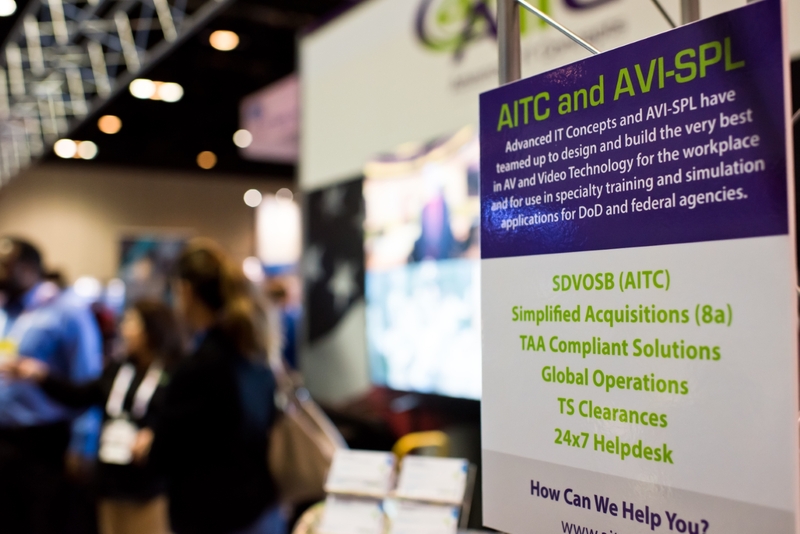 AITC can create bundled services and solutions to make it easier for the government and other customers to purchase. What’s even more helpful and cost-effective is that by creating these bundled solutions, upgrading and maintaining equipment can be a seamless, unified process instead of in a piecemeal way. Whatever kind of IT system you have, when you’re ready to upgrade, these IT solutions can be integrated into yours. Not only can you have the latest software and hardware, but you can have them at a competitive price—saving you overhead costs. But what if you’re not interested in purchasing equipment and software? We can provide something akin to software as a service (SaaS). It’s what White calls “facilities as a service”, which allows you to save capital expenditures and use operational expenditures. You don’t have to be responsible for servicing or maintaining the software and equipment. But if you want to own it after the service contract is up, that’s also an option. “We’re putting you on that path to consistency. It’s all about making it standardized, making it easy to acquire, easy to specify, and streamline the acquisition process,” says Perez. So what kind of technology could be available in a smart space? White used the example of a conference room being able to recognize employees by facial recognition, greeting them and asking if they’d like to use the audio conference or by starting the audio conference immediately. The conference room could also be able to count how many participants are in a room and start suggesting optimized usage (e.g., if there are larger conference rooms being used only by a small number of people). One concern about having more remote capabilities for training and collaboration could be about security and confidentiality. Our team can design and configure to any specialized classification, whether it’s secret, top-secret, JWICS, NIPRNet, SIPRNet, etc. You could have a monitor-controlled video wall with as many LED screens as you might need. At I/ITSEC, AITC showcased a 2’ x2’ knowledge wall, but our capabilities can go far beyond that number of screens. If you’re seeking video link services, we also offer two types. One is a ReadyCam studio, which is used by national cable channels such as MSNBC, CNBC, CNN, and others for interviews. These transmissions don’t require satlink trucks—just an internet connection and a 10’ by 14’ sized room. This media room give a professional, polished look for one person and can be remotely operated. And one way this technology can be used in the government is if a leader wants to professionally, effectively, and quickly communicate a message within an organization. This live video could be fed into anywhere there’s a screen—desktops, laptops, cellphones, breakrooms and conference rooms. Another way to use video link services is to capture content. If your desire is to make a training more educational and engaging, or you simply want to capture what a subject matter expert has to say on a topic, we can help with the post-production facilities, as well as with editing and graphics. 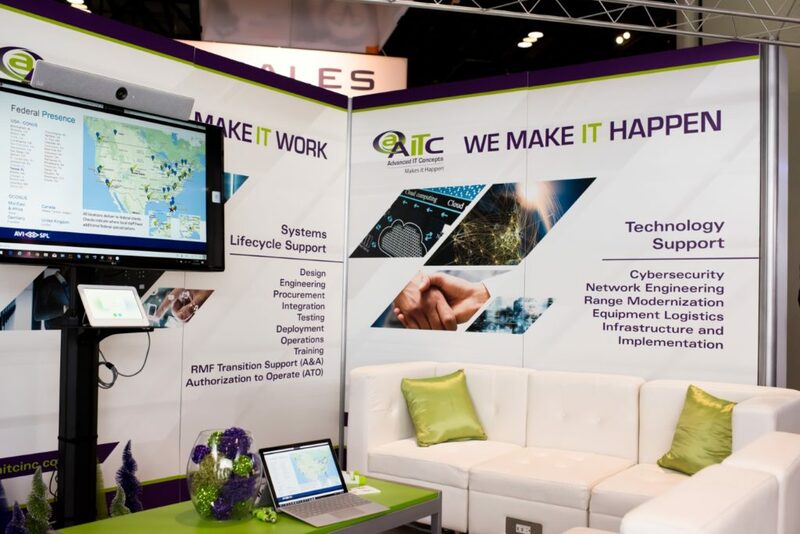 As a systems integrator, AITC wants to bring end-to-end IT solutions to governmental agencies as well as commercial organizations. To learn more about how we can help your organization facilitate collaboration and training, please contact Lydia Perez in our sales department at sales@aitcinc.com.